He falls out of skies. He lands a devastating diagnosis. Valentine’s Day for many of us meant time spent with our one true love. 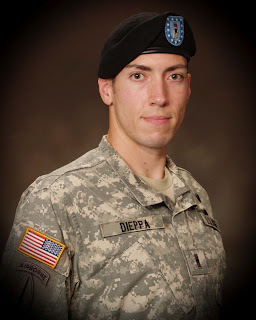 For Signal Army Warrant Officer Phillip Dieppa four years ago, it was a true nightmare. What started out as a romantic getaway with his wife at a ski resort in West Virginia ended up changing Phillip’s life forever. A snowboarding accident on the eve of Valentine’s Day later resulted in a football-sized spleen on the verge of rupturing, a condition that would have ended his life in minutes. But tests after the accident also revealed even scarier news: Phillip had cancer. Phillip was diagnosed with Chronic Myelogenous Leukemia and given a prognosis of just a few short years to live. Trained at hurling himself out of airplanes, this Iraq veteran had already endured more than most young people, but nothing prepared him for the battle of his life. Through it all, his wife Natasha served as his protective armor, but she also absorbed staggering heartbreak. Life with Phillip, who was just shy of 22 years old, might only last 3 to 5 more years. Thankfully almost four years later, after countless bone marrow biopsies and grueling treatments, Valentine’s Day no longer marks the worst time of Phillip’s life. This February it reminds him of a battle fought hard and won, and finally being cancer free. Phillip and Natasha now have a brand new love – life. Phillip with his wife after crossing the finish line in Savannah. TNT alumni and survivor, Phillip Dieppa, completed his first event with TNT this past fall in Savannah, GA at the inaugural Savannah Rock 'n' Roll half marathon. Phillip is currently the team's Honored Hero for the Augusta market. Karen is a Public Relations Manager for UPS and has worked there for almost nine years. She completed the ING half marathon (2009) and the Nike Women's marathon (2010) as a TNT participant and served as a mentor in the fall of 2010 while training for and completing the Zooma half marathon. Karen has raised over $5,000 for TNT and now serves on our PR Committee. My name is Alex Strickland, and I am a survivor.When I was four years old, I was diagnosed with Acute Lymphocytic Leukemia. Luckily, within six months my wonderful doctors had battled my cancer into remission, but I then went through another two and a half years of maintenance chemo therapy. At age five, I was admitted to the hospital with a bad case of chicken pox. Normally that wouldn't be so dangerous, but the chemo I was previously on had taken a harsh toll on my immune system. The doctors were unsure I would make it. While I was in the hospital, I had the privilege of being an Honored Hero for Team In Training's triathlon team. My best friend, who I went through chemo with, went to the triathlon with me and we cheered as his mother crossed the finish line. My health did come back, and I'm alive and well today in large part to research funded by organizations like The Leukemia & Lymphoma Society. So today I am carrying on what they've done for me. I've signed up for Team In Training myself, and in June I will be completing America's Most Beautiful Bike Ride, a 100 mile ride around Lake Tahoe, raising funds along the way to give back to the cause that I've benefited from. So why is this post titled "Today is Not Just Valentine's Day" you ask? Well, today is something much bigger for me. February 14, 2000 was the day I took my last chemo treatment. Today I celebrate 12 years of health, 12 years of being a survivor, and 12 years since I put cancer behind me. Join me in celebrating survivorship and the advances we've made in cancer research by donating $12 to LLS today to give today and tomorrow's kids even better treatments than what I had and to make cancer a thing of the past. That way we can focus on the little things, like Valentine's Day, instead. Happy Valentine's Day everyone! TNT participant and Honored Teammate, Alex Strickland, is currently training and raising funds to participate in America's Most Beautiful Bike Ride in Lake Tahoe this June. 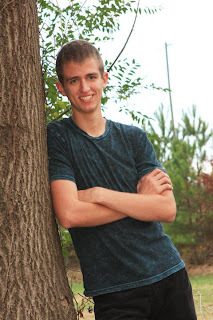 Alex is a freshman at North Georgia College & State University studying pre-med and aspires to be a doctor.